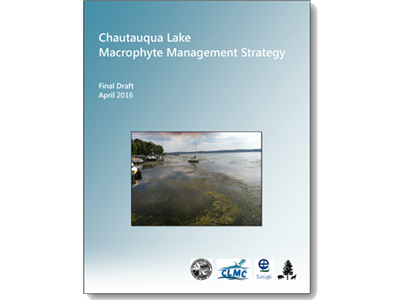 EcoLogic provided technical review, editing, and design of the Chautauqua Lake Macrophyte Management Strategy, which presents a distinctive approach to managing submerged aquatic vegetation in ways that minimize conflicts between human uses and environmentally sensitive areas. In the document, Chautauqua County uses an ecosystem-based management approach to defining macrophyte management areas in this western New York lake. EcoLogic helped guide the assessment of recommended management techniques, and synthesized input from a large team of collaborators and reviewers to produce a technically sound document that has been praised as a model for other water resource managers to follow in lakes throughout the region and beyond.